Home Uncategories Thrill, suspense and mystery seems to be the new approach of presenting love stories on television these days..
Thrill, suspense and mystery seems to be the new approach of presenting love stories on television these days..
With Indian television progressing towards experiments on various genres, it is befitting that the makers become audacious about presenting concepts for celluloid viewing. Be it mythological or historical, comedy or drama, almost every category has a commanding story in a soap being on-air which has managed to impress. But if there is one genre that has been consistently cliched then that is of love and romance. A girl and a boy falling in love under unanticipated circumstances and their love story going on to become a memorable one which has a happy ending - that was the basic plot-line of the several shows back then, which was entangled with unwanted entries and mindless affairs. However, times have changed and the idea of love stories has changed too (Thank God for that!). Makers are no longer skeptical to present a love story that has more realistic characters which may also include having a dark side. So, today, I analyse how 'dark' is the new necessity for a love story on Indian TV. Even before I get into writing about Ek Deewana Tha, let's not forget that modern television was struck with fresh and bold content in the form of a dark and gritty love story revolving around Durga (Sanjeeda Shaikh) and Shaurya (Vatsal Sheth). The critical acclaim and success of Ek Hasina Thi paved way for other makers to showcase their bravura with the storyline. And then came Beyhadh, the game-changer! Even after the success of Ek Hasina Thi, there wasn't a bombardment of shows with similar shades till Sony TV presented us with Beyhadh last year starring Jennifer Winget, Kushal Tandon and Aneri Vajani. A psychopathic and obsessive lover with murder, suspense and betrayal as the cohering aspects, Beyhadh brought a revolution in itself. Backed by Jennifer's magnificent performance, the show broke several stereotypes about how love stories can just not be happy, but dark and unforgiving too. I mean come on, you think a love story, in reality, is as easy as quintessential Bollywood and TV presentations portray to be? Absolutely not. Of course, I don't mean every love story has murder and obsession attached to it too, but it is the grit reality that connected with the viewers instantly. With Beyhadh all set to go off-air next month, there was a worry as to what will happen to the viewers of this genre as it is not everyday that we come across dark love stories, isn't it? Well, things have drastically changed as now we have a plethora at our disposal. To begin with we have Arjun Bijlani returning with Colors' Ishq Mein Marjawan opposite Aalisha Panwar. After tasting humongous success in Naagin and a miss with Pardes Mein Hai Mera Dil, Arjun has now taken up the challenge of playing a character with grey shades in this romantic thriller. The show is the first amongst the lot to go on-air and we can only wait to see if it is going to stay true to its genre or end up becoming a monotonous saga. And then we have three mega shows in the form of the Jennifer Winget-Harshad Chopra starrer - Adhura Alvida, Vikram Singh Chauhan-Donal Bisht-Namik Paul starrer - Ek Deewana Tha and Vatsal Sheth-Nikita Dutta-Zayed Khan starrer - Haasil coming up too. There is an uncanny resemblance between all the above three shows, as it boasts one female protagonist with two male protagonists complementing (considering Sehban Azim's character in Adhura Alvida to be equally important). 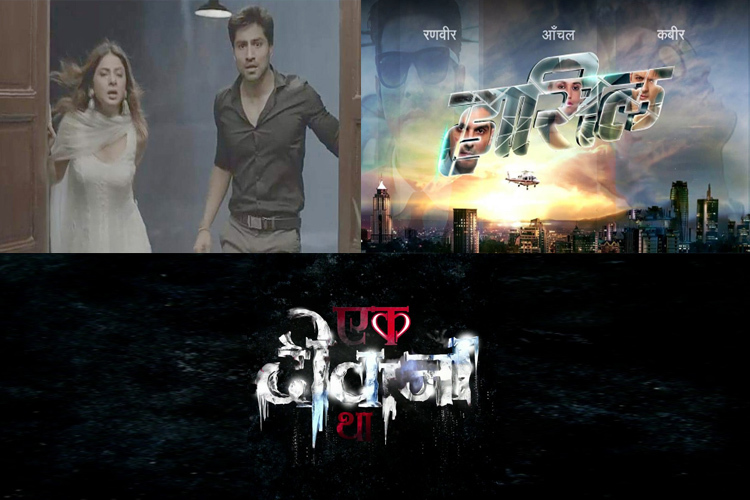 With a premise that includes betrayal, suspense, thrill, mystery and finally love, it couldn't have been more evident as to how these shows spell the new trend on Indian television. I was complaining about exploiting a trend following herd mentality when the supernatural wave took over television where illogical and dim-witted plotlines made the viewers cringe about it. However, with dark love stories being experimented profusely, we are in for a treat. The neo-noir genre is one such category that can have infinite presentations and still stand-out in every offering if treated with intelligent writing and intermittent exhibition. Unfortunately, the history of Indian television practising a concept too much is actually way too much. It not only destroys the bliss of watching a fairly executed TV show but also forces you to stereotype the scenario. Having said that, being a fan of the genre, I sincerely hope that I, as a viewer along with a million others are in for a genuine treat of fabulous storytelling.